Even in the bad conditions (heavy snow), they were so helpful, happy and professional. We were still able to move! Very efficient and helpful. First class!! Excellent staff - polite and friendly. Very professional. Graham also gave us a 5 star review on Facebook on 09-03-18 saying; Brilliant team. Had to be careful not to stand still or would have ended up packed in a box. Poor dog had is food packed! 4 lorry loads packed over 4 days and delivered in 2 days. Nearly everything left in right room, carefully assembled and handled. Never a complaint even when the lads had to carry some furniture sll the way to the river house. Dean was a tremendous organiser and nothing was too much trouble, even put some cases in the loft. After 2 weeks have unpacked 70 boxes with 60 odd still to go. thanks to Nickie and Rickie for their patience with the delayed date. A thoroughly professional organisation, to be highly recommended. Coureous & professional. Thank you. Nice polite service. Quick and everything done as asked. Just to thank you and your team for the excellent and we mean excellent service you guys provided. Everything was perfectly stored and returned even after two years storage with no sign of dust, damp or neglect. All the delivery and placement of household furnishing's was treated like the guys own personal belongings. We have been extremely impressed with the company service at every stage and wish you and your team a fabulous continuation of a successful business. Thanking you all again. Excellent and polite/careful service. Thank you. Excellent service, very professional and courteous and helpful - Thanks. Review left on Facebook on 12-02-18 at 19:47 From our very first contact with Move It Removals for a quote to the end when they actually moved us on completion day the service from move it Removals was First Class and I would have no hesitation in recommending and using them in the future. Throughout the upheaval of moving whenever I wanted to know something from Nicky, I got answers and help straight away. 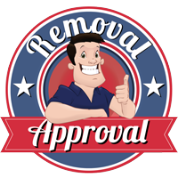 On the actual day of removal the two man team of 'Ricky' and 'T', both did an excellent job and wouldn't even let us move a box, in fact in our opinion (from a previous experience with another company a few years ago) they went over and above what we expected from a removal company. Great service throughout and fully recommend. Very good service. Rosa & Adam also left a post on Facebook on 23-02-17 saying: Super impressed with everyone we came into contact with from beginning to end of our family move. The guys who packed us up, loaded up our belongings and moved us could not have been more quick, efficient and respectful. On top of this, they were so friendly and helpful, which made a stressful time so much more pleasant and easy. They were particularly great with my toddler and moved some really delicate ornaments as well as a piano and a kiln. Thanks to everyone at Move it again. The guys were great, really friendly, quick and thorough. Cannot improve service. It was excellent. Fabulous service - would recommend. EXTREMELY polite and courteous. Everything good! Thank you - Took the stress out of a stressful day! Review left on Facebook on 15-01-18 at 20:05 The men moved my friend today and went above and beyond what they should have done. I would absolutely recommend this company. Well done guys. You are amazing. Review left on Facebook on 16-01-18 at 13:22 Amazing service from beginning to end. Super-helpful, friendly, smiley team who made the day much less stressful than I was anticipating. Would definitely recommend them. Review left on Facebook on 22-01-18 at 21:21 We cannot recommend Move It highly enough. They were helpful, courteous and uncomplaining despite the snow, freezing cold and delays during the day. Not one breakage and everything in order. Review left on Facebook on 03-01-18 at 18:24 The whole process of moving is very stressful.. The admin team (Nicky) at the office was always very helpful and friendly. We moved just before Christmas and the removal guys were outstanding. They were helpful, considerate, caring, speedy and entertaining. It was great having these personalities help move us and this stressful time. Thank you. Review left on Facebook on 24-01-18 at 18:30 Really impressed with the service received from Move it Removals. They are extremely professional, punctual and friendly. They stored most of our belongings for 4 months in between sale and purchase of houses, and everything was exactly how it had been when they took it. Such a massive stress relieved and well worth the money. Review left on Facebook on 22-01-18 at 09:51 Firstly, these guys are very efficient well organised and professional. But above all they are nice guys and are really only there to help you move in to your new home. It's their attitude that is the most impressive. They know what needs to be done, they get on with it and overcome any problem that comes up. Don't bother going to any other removal firm, just get these people to do it. Excellent and a very smooth move!